Abington, Massachusetts. 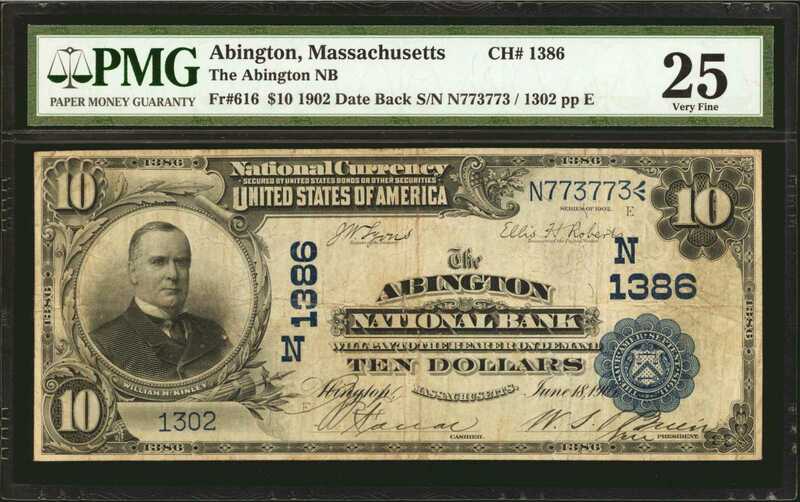 $10 1902 Date Back. Fr. 616. The Abington NB. Charter #1386. PMG Very Fine 25.A paltry 5 large size notes are known for this bank that issued continuously from 1865 to 1935. Repeater serial number 773773. Pleasing pen signatures. Evenly circulated and free of any problems. Any example from this bank is a sure thousand dollar note. The only $10 Date Back and very desirable.